A few weeks ago, my husband made some amazing pumpkin enchiladas. They had a pistachio dust on top. Well he ground up too many pistachios and I have been wondering what to do with them ever since. 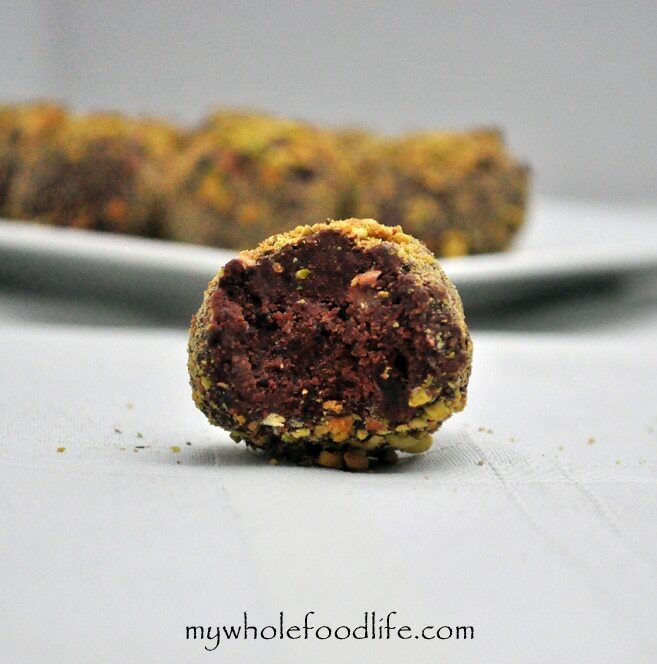 So I decided to make chocolate pistachio truffles. No fuss truffles that are melt in your mouth delicious! In the food processor or blender , combine the pecan butter and dark chocolate. Once they are mixed well, add in the dates and salt and mix until well combined. A ball of dough will form. Spread your chopped pistachios onto a plate. Roll the dough into balls, then roll the balls through the chopped pistachios. Once that is done, place the balls on a lined baking sheet . Once all the balls are done, stick the baking sheet into the fridge to firm up.